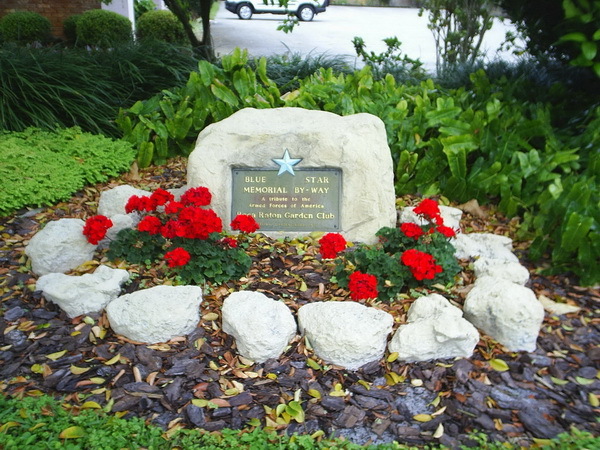 The Blue Star By-Way Marker was dedicated at the Boca Raton Garden Club on May 2, 2006. It is located in the front yard of the property under a sprawling Gumbo Limbo tree. Blue Star Markers honor all men and women who have served in the armed forces. It was funded in part from a civic development grant program called "Let Freedom Ring" through the Principal Financial Group Foundation in conjunction with the National Garden Club. It is only fitting that the By-Way Marker is located on Garden Club grounds which were once part of the Boca Raton Army Air Field during World War II.